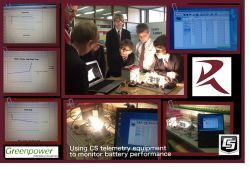 Redmoor Academy use two Campbell Scientific CR200 dataloggers within their GreenPower Engineering after-school STEM club. This is a national scheme where pupils put their engineering skills to the test by building, adapting and racing an electric racing car against other schools. One of the loggers is used for test bench battery analysis and the other is situated on the car and is used for on-board telemetry. The school submitted a collage of images of the club using the dataloggers as an entry to the 'Campbell Scientific In Action' photo competition in the 'Machines' category. 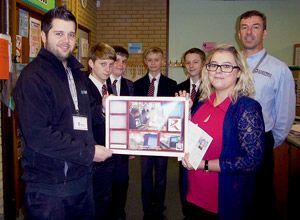 The picture was deemed to be the category winner and the school was presented with a £50 voucher to use to purchase equipment for the club. The picture shows some of the club members along with Miss Burton, who manages the club and STEM Ambassadors Alisdair Bowie (MIRA) and Iain Thornton (Campbell Scientific).